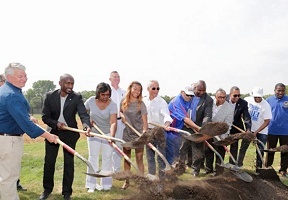 Mayor Rahm Emanuel and Chicago Park District joined Exelon Corporation to break ground on the Exelon Student Recreation Center at 1301 W. 14th Street. The new 100,000 square foot multi-purpose indoor facility will house an indoor track, artificial turf field, basketball courts and several multi-purpose community rooms. The indoor athletic facility will support a broad range of activities and events, including athletic league programs and regional competitive events for community youth and young adults. 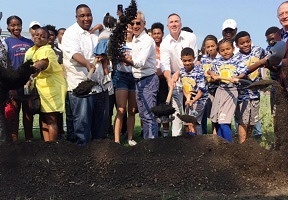 Outdoor improvements will also be made on the existing 9.24-acre Addams Park. Funding for the Exelon Student Recreation Center will be provided by the City of Chicago, the Chicago Park District and the Chicago Housing Authority, as well a generous donation from Exelon, as well as The Inner City Education and Recreation Foundation. The park is expected to serve an estimated 7,500 new residents moving into the adjacent 120-acre mixed-income Roosevelt Square development. This will also serve residents in the co-located Taylor Street Apartments and Roosevelt Branch Library, which are expected to open in 2018.